She clarified that "no such incident took place"
Actress Sanjana Sanghi has slammed reports that claimed her Kizie Aur Manny co-star Sushant Singh Rajput made her "uncomfortable while filming" the project. In a statement posted on social media this evening, Ms Sanghi called the reports "baseless" and clarified that "no such incident took place" with her on set. "On returning from a long trip to the US yesterday, I read several baseless and unfounded stories with respect to misconduct and misbehaviour on the sets of our film Kizie Aur Manny. I would like to clarify that no such incident took place with me. Let's put an end to these conjectures," read her statement. The post has also been shared by Sushant, who had earlier dismissed the reports. 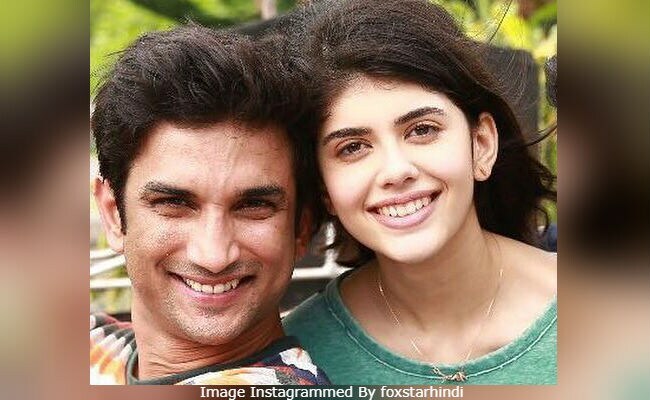 Last week, reports of Sushant "flirting" with Sanjana Sanghi appeared on social media. It was also said that her parents had to intervene after director Mukesh Chhabra (now suspended from the project due to #MeToo allegations) did not take a stand. However, Sushant denied the reports and said it was a "well-timed and agenda-driven smear campaign." In his defence, the 32-year-old actor also shared screenshots of their conversation, right from Day 1 to the last day of shoot and left it on the Internet to decide. However, Sushant has now deleted his post. Meantime, Mukesh Chhabra also tweeted in support of Sushant and wrote it's "somebody else's ulterior motive." He appears to now have deleted his Twitter account. Mukesh Chabbra was suspended from the director's post of Kizie Aur Manny after two anonymous aspiring actresses named him in their #MeToo stories. The producers Fox Star Hindi later issued a statement about the same. Kizie Aur Manny is the Hindi adaptation of John Green's The Fault In Our Stars. Sanjana Sanghi is making her Bollywood debut with the film.